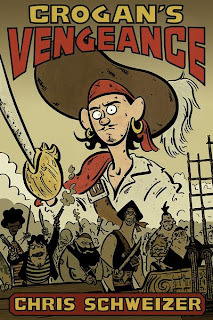 I had the pleasure of reading a preview copy of Chris Schweizer's upcoming Crogan's Vengeance from Oni Press. The story revolves around "Catfoot" Crogan, an unintentional pirate in the early 1700s. As the story opens, he's receiving a lashing from his captain aboard an English (presumably navy) vessel. In short order, though, the ship is captured by pirates and Crogan is pressed into service where he runs afoul of D'Or, an ox of a pirate if ever there was one. Crogan spends much of the rest of the story trying to survive being a pirate, all while trying to hold on to his honor from his previous life. The story itself is compelling. We're quickly shown that Crogan is a talented individual and he earns his Catfoot nickname readily. And while it's certainly appropriate given his agility, we also learn over the ensuing pages that he's equally agile with his thinking. It's this rapier wit that rubs other characters (noteably, those less mentally able) the wrong way but it also helps Crogan out of some tight spots, winning the respect of others who aren't quite so muscle-headed. Odds are, though, Schweizer does actually do some page layout work first and does sketches and whatnot, as many artists do. In either case, it's impressive. If he's coming up with all this on the fly, it speaks to his inherent storytelling abilities, if it is laid out and planned in advance, it speaks to his talent for making it look effortless. Between his easy linework and the solid story, I would consider this a great read for anyone. Ah, but here's the really cool bit: it's historically accurate. As many of you may known, I'm a bit of a fan of pirates. I've done more than a little reading on the subject, and it's abundantly clear to me that Schweizer has, as well. While most of the characters themselves are fictitious, the general themes, attitudes, problems, events, and everything else are based on how life at sea really was back then. From the almost sadistically evil navy captain to the piratical subterfuge and strategies employed throughout the book, this will give readers a fairly accurate depiction of what a pirate might go through. There's no buried treasure, there's no walking the plank, there's no parrots on every other shoulder. There IS drinking, fighting, and general carousing, though. More than enough, in fact, to keep anyone looking for a great adventure entertained. Crogan's Vengeance is due out in September, so be sure to put your orders in with your LCS now! Maybe it's just me, but if you have shown that swordfight drawing tome I would have bet money that Jeff Smith had drawn it!